No matter if you need cleaning services for your home, office or business, we would provide you with a nice experience by working with us. We are company, currently located in Battersea, which has a positive background and numerous recommendations from our customers, who are all satisfied with our results. We stand out among others, because we provide top-notch and flawless cleaning services at affordable prices. Our cleaning teams are experienced and punctual and you can count on us every day, including the weekends. Health is the most important for us and our goal is to provide safety cleaning services by using only biological detergents. If you want to rejuvenate the look of your place and provide one healthy atmosphere, rely on our cleaning services, which we deliver in SW11. Our cleaning crew is professional in every aspect of their work and before they leave, the will make sure that you are absolutely satisfied with their results. They are detail-oriented and you can be sure that nothing will be overlooked or missed. They are well-organized and know how to do their job in a flash, without sacrificing the quality. The technologies with which they work are of best quality and that is another proof of their immaculate results. Our cleaners are positive people, who will listen carefully to your wishes and comply with them. If you want to beautify the look of your place, it’s not necessary to spend all of your time in scrubbing. Get advantage of our expert cleaning services, and spend your time on more pleasant activities. To trust in the hands of a professional is always better and the long-lasting results are guaranteed. 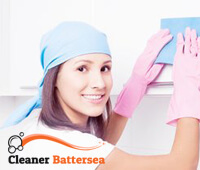 Let us provide all the residents in Battersea, SW11 with one neat and clean atmosphere. Get in touch with our representatives and get your personal quote. You will be surprised by the low prices, which we offer.